Wavefront distortion can degrade image quality by reducing contrast or compromising resolution. In several microscopy applications, reducing wavefront distortion is critical to achieving the microscopy method. Specifying and selecting optical filters that minimize wavefront aberration is important to maximize or enable optical system performance. This article elucidates how to select optical filters for high performance microscopy, and provides guidance on choosing Semrock catalog filters for wavefront distortion performance required for applications. Both standard and advanced microscopy methods require certain minimum standards of flatness on dichroic beamsplitters. For example, super-resolution and TIRF microscopy cannot be achieved if the flatness of the critical dichroic beamsplitters is worse than required. This Tech Note introduces the topic of how to choose Semrock dichroic beamsplitters appropriate to the microscopy method. Optical filters are generally composed of multi-layered, thin-film coatings on plane, parallel glass substrates. There is variability in substrate flatness, and, additionally, the substrate may slightly bend after coating. For transmitted light, such bending has little effect on transmitted wavefront error (TWE) other than a slight displacement of the beam axis. 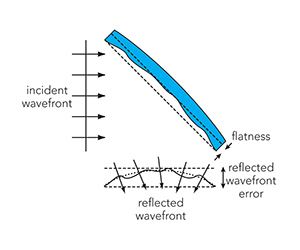 However, for reflected light, especially light incident at non-perpendicular angles, deviations from flatness (see Figure 1) have two effects on reflected wavefront error (RWE): (1) the focal plane may shift position, or (2) the beam may acquire optical aberrations (e.g., astigmatism). 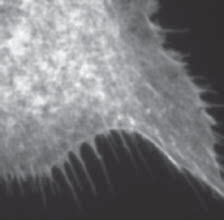 A focal plane shift can be corrected by lens or camera adjustment in some microscopy methods, but in others this shift cannot be adjusted for and can therefore impede proper function. Also of significant concern, optical aberrations can degrade image quality, as illustrated in above Figure, and can compromise the microscopy method. In determining suitable flatness need for a given application, the most important parameter is often the diameter of the beam striking the dichroic beamsplitter surface. Table 2 shows the Semrock product best suited to the application, for maximum diameter values. 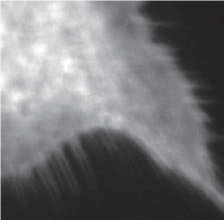 For more specific information, and for other beam diameter value and microscopy examples, the Semrock White Paper on this topic  provides additional information on RWE, TWE, and microscopy methods, as well as guidance from a system designer’s perspective. Because of potential degradation of imaging quality, it is important to determine when the flatness of dichroic beamsplitter is critical to a microscopy method. Table 1 lists examples of popular microscopy techniques in which it is critical to have dichroics of high flatness. As noted in this table, high flatness requirements can apply to both the illumination (excitation) and the detection (emission) light paths. Table 1: A list of popular standard and advanced microscopy methods, categorized as to criticality of dependence on reflected wavefront flatness. Semrock offers an extensive and industry-leading range of catalog filters for a variety of applications with specific Flatness/RWE needs. The Semrock Flatness Classifications listed in Table 2 provide an intuitive approach to selecting products of appropriate flatness for a given application. In determining suitable flatness need for a given application, the most important parameter is often the diameter of the beam striking the dichroic beamsplitter surface. Table 2 shows the Semrock product best suited to the application, for maximum diameter values. For more specific information, and for other beam diameter value and microscopy examples, the Semrock White Paper on this topic  provides additional information on RWE, TWE, and microscopy methods, as well as guidance from a system designer’s perspective. Table 2: Semrock Flatness / RWE Classifications and recommended catalog dichroic family information along with maximum allowable beam diameter values. More detailed information is found in the Semrock White Paper .